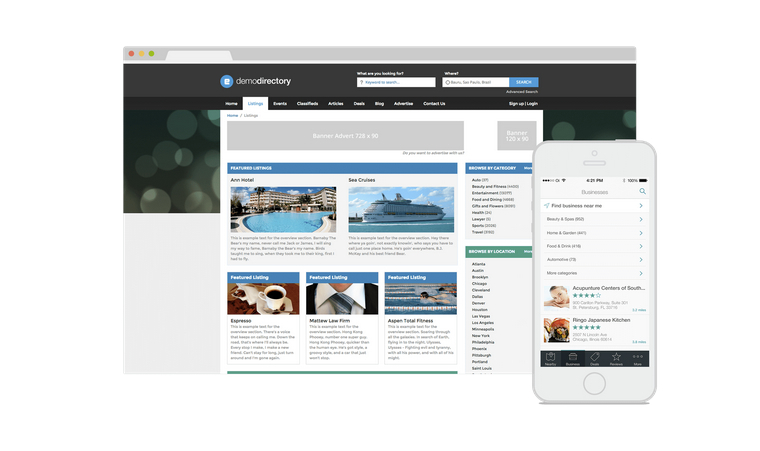 So you have a great looking directory app for your business with a ton of powerful features. The issue now is that you need to get users to actually download and install your app so you can start taking advantage of its capabilities. People always love getting something for free and you can use this to help drive downloads of your app. Offer something for free from your store or business that is inexpensive and doesn’t put you out too much, such as a small fountain drink, a bag of golf tees, a small cookie or similar. Offer it to customers who show you they have downloaded and installed your app. Continue with this strategy until you have an adequate amount of app users. Quality screenshots and icons are essential to the promotion of your app. It is the best way to showcase your app and make it appealing to potential users. Make sure to start with a solid library of high-resolution images and icons that you can use for marketing materials and advertising your app to potential users. Be sure to provide links to download the app from the app stores to make it as quick and easy as possible for people to view the details of your app and download it to their accounts. Another easy strategy is to create some simple cards, notes, buttons or fliers that include instructions on how to download your app. Keep them in your business and hand them out to anyone who stops in or walks by. Include the name of the app and tell them the best search term to enter into the app store to easily find and download the app. Work to build a following and build up some momentum on all the relevant social media platforms: Facebook, Twitter, Instagram, LinkedIn, etc. Follow media members who carry influence in your specific industry or would be followed by potential customers for you business. Send out posts, links and images for you app to build up some interest and further share the app features that your users will benefit from. App Store optimization is a method of finding good keywords that people might search for and making sure to put them either in your app title, description or keywords for your app listing. If you already have users downloading your app, reach out to them and ask how they discovered your app, and if that was on the app store, which keywords they searched. Be sure to include all relevant keywords and phrases associated with this feedback and further build on them. Take #6 even a little bit further and look for ways to localize your description and keywords. If you app or business mainly serves a local or regional area then be sure to include keywords and phrases that call out this specific location. Example: “san jose shoe store” or “morris county delivery service”. This will help to increase the amount of relevant app users who can take advantage of a localized app. If your business does not have items it can give away for free (#1), then maybe you can trade a download for a service. Such as a salon offering a 15-minute massage in exchange for a download, or a cleaning service offering 10% off your next appointment after you download the app. Use what resources you have available to offer some value in exchange for an app download. A key strategy to promoting your app to potential users is to be able to communicate the value they receive if they have the app. One of the best ways to detail this is to offer mobile-only promotions through coupons, deals or loyalty cards that can only be received and used through your mobile app. Post these promotions online or in your business for customers to see and add a tagline such as “Available to Mobile App Users Only” or something similar so they know to download your app right away to gain access to these deals. Interested in creating mobile apps for all kinds of business types? Looking for features that drive business, like mobile coupons, custom loyalty cards and more? Check out the new www.lumeapps.com or call 1-703-914-0770 to learn how you can start building mobile apps that people will love. This entry was posted in Sales & Marketing Roundtable and tagged directory app. Bookmark the permalink.